George Town, Penang is a famous tourist spot for mural arts. However, most of the time you have to walk or cycle under the hot sun to hunt down all the mural arts. 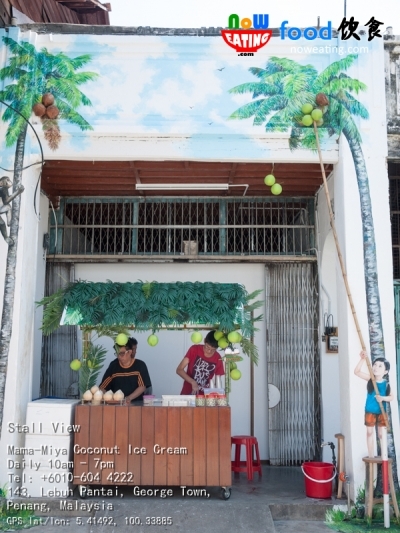 Good news is that, not far from Armenian Street with famous “Little Children on a Bicycle” mural, you can rejuvenate yourself with a bowl of homemade coconut ice cream. 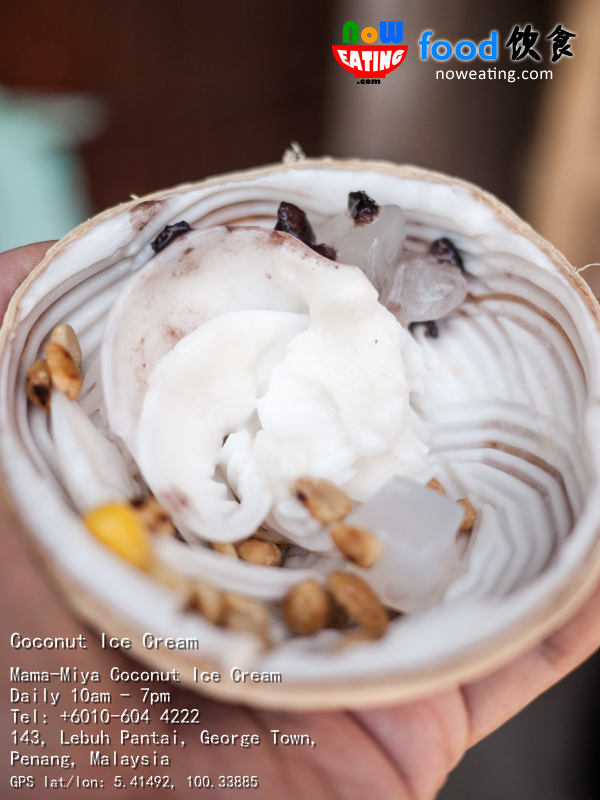 The coconut ice cream stall is called Mama-Miya Coconut Ice Cream and is very easy to spot if you are driving along the one-way street of Beach Street (Lebuh Pantai). When you reach the crossroad of Armenian Street with the famous “Bicycle” mural art on your left, continue driving and notice a shop painted with two coconut trees on your right, that’s the stall. 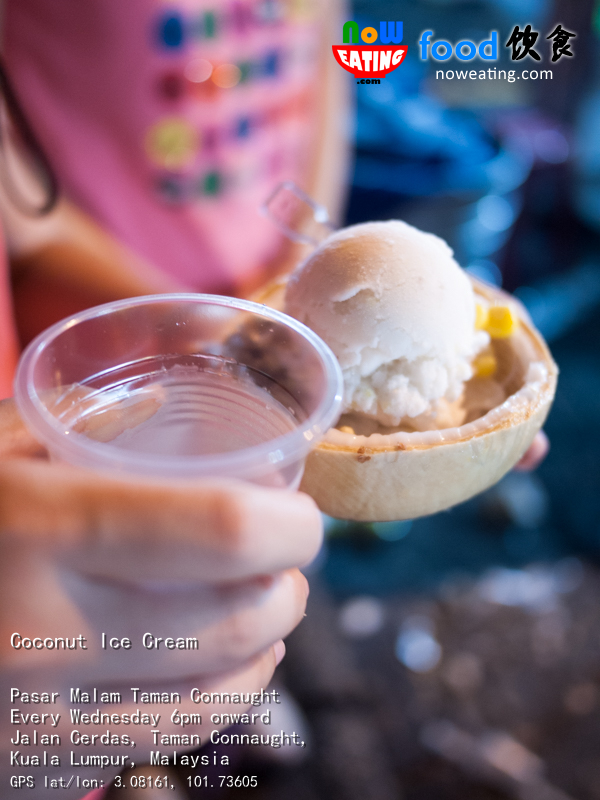 Even though coconut ice cream is originated from Thailand, our first encounter with Coconut Ice Cream was at Taman Connaught Night Market at Kuala Lumpur back in year 2013, when we had our KL-Malacca trip during our Christmas holiday. Other than the coconut ice cream on a coconut shell, you will be given a glass of fresh coconut juice which works very well as thirst quencher. Good news for us is that, there is no need for us to travel to KL or Thailand for this delicious dessert. 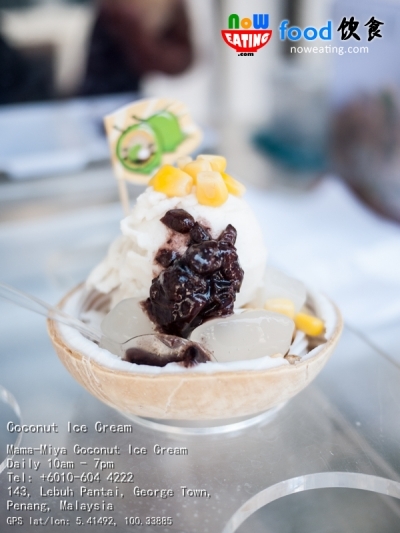 At Mama-Miya Coconut Ice Cream stall, you can have a bowl of it with rich toppings such as red bean, sweet corn, peanut, Nata de coco, and Attap Chee. Beneath the ice cream, you will be surprised with young coconut flesh. The coconut ice cream is not too creamy and has only a hint of coconut milk (Santan) taste. Even those anti-coconut-milk will find it acceptable. 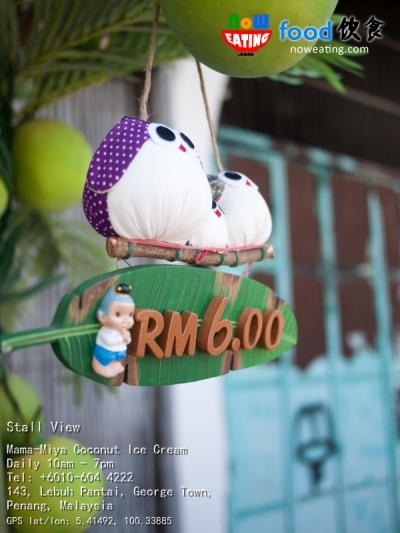 A bowl of coconut ice cream is priced at RM6.00. Personally, we find it reasonable considering the quality of ice cream we are getting. The stall opens daily from 10am – 7pm.